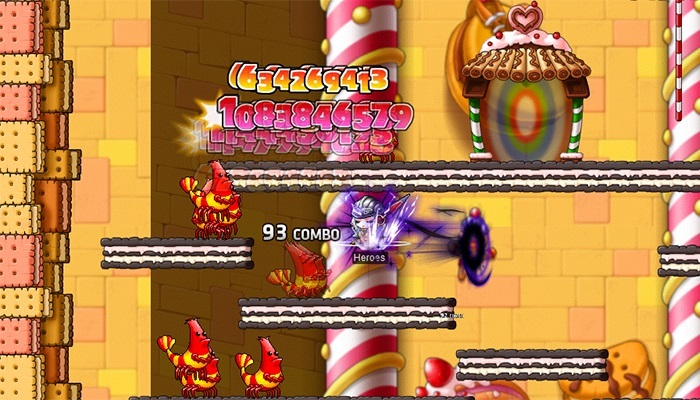 Thanksgiving Events: November 7 – November 28 | Dexless, Maplestory Guides and More! Turkeys are starting to appear near Henesys, Mu Lung, Leafre, and other major towns! If you hunt these birds, you can find all sorts of fun items. Players Lv. 33 and above can begin by accepting the ‘Thanksgiving’ quest from NPC Cassandra. Then start hunting Plump Turkeys! These turkeys have been stuffed with lots of great rewards. Dress up in the spirit of the season with a Pilgrim Hat, Chief Axe, or Maplehontas equip. Restore needed HP and MP with delicious Thanksgiving food including Roasted Turkey, Cranberry Sauce, Corn, and more. You may even get your hands on special items such as a Roasted Relaxer Chair, a Nebulite Box, a Special Potential Scroll, or a Special Bonus Potential Scroll! Young magician Bianca has accidentally turned the Thanksgiving dinner into living monsters! Join the Food Fight to help her catch the delicious creatures. To begin, players Lv. 33 and above can accept the ‘[Food Fight] Revolting Food’ quest from the star event notifier on the left side of the screen. You can enter the Food Fight Hall up to three times a day. Once inside, you have twenty minutes to complete all thirty stages, and the tasty monsters get tougher the further you go! The rewards differ depending on how many stages you clear. See how far you can get and earn EXP, Drop Coupons (1.5x, 2x, 3x) and useful buffs! Food Fighter's Power: Untradeable, 1-day duration. Gives MaxHP/MaxMP +200 for 30 minutes. Food Fighter's Power: Untradeable, 1-day duration. Gives MaxHP/MaxMP +600 for 30 minutes. Burning Aroma: Untradeable, 1-day duration. Gives Weapon ATT/Magic ATT +80 for 15 minutes. Super Satisfied: Untradeable, 1-day duration. Gives MaxHP +5000, Weapon DEF/Magic DEF +80 for 15 minutes. Nice 'n' Greasy: Untradeable, 1-day duration. Gives DEX +8 for 10 minutes. A Light Snack: Untradeable, 1-day duration. Gives MaxHP +2000, Weapon DEF/Magic DEF +200 for 20 minutes. After-Dinner Delight: Untradeable, 1-day duration. Gives DEX +2, Speed +20, Jump +20 for 20 minutes. Late-Night Treat: Untradeable, 1-day duration. Gives Weapon ATT/Magic ATT +20 for 20 minutes. Dessert for Dinner: Untradeable, 1-day duration. Gives MaxHP +4000, Weapon DEF/Magic DEF +400, Weapon ATT/Magic ATT +40, Speed +40, Jump +40 for 40 minutes. NPC Cody wants you to find him some Turkey Eggs! 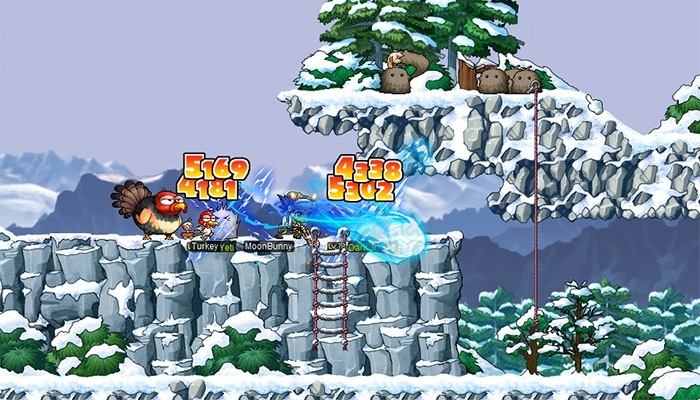 Luckily, there are Turkeys appearing in certain locations in Maple World including Henesys, Magatia, Leafre and more. Turkeys drop three different colors of eggs depending on your level range. Players Lv. 33-49 can look for Yellow Turkey Eggs, players Lv. 50-99 can hunt for Green Turkey Eggs, and players Lv. 100 and above can search for Blue Turkey Eggs. You can turn in your eggs to Cody for special rewards, which differ depending on which color egg you turn in. You can earn delicious Thanksgiving-themed restorative items, Potential Stamps and Scrolls, a Turkey Pet, a Nebulite Box, Advanced Boost Potions, and more! This quest is repeatable every 30 minutes.